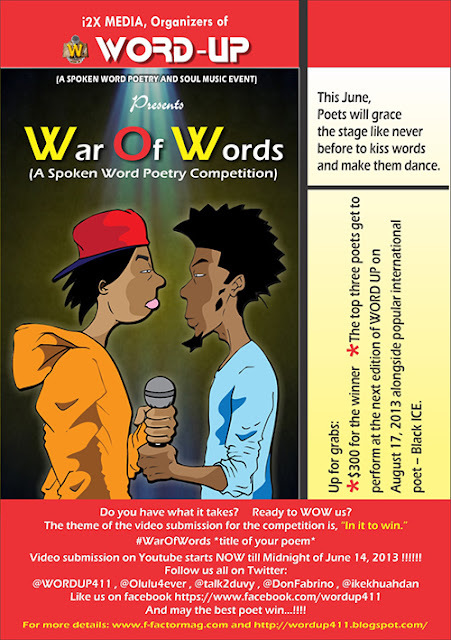 WORD UP: Video entries for "War Of Words" is now on......!!!!! Video entries for "War Of Words" is now on......!!!!! This June, Spoken Word Poets will grace the stage like never before to kiss words and make them dance. The top three poets get to perform at the next edition of WORD UP on August 17, 2013 alongside popular international Def Poet – Black ICE. Submit an original poem that is in English, pidgin English or a combination of both. Please note that All non-english words used in the poem must be explained in the information box of the video. Ensure The title of your poem contains the official hashtag #WarOfWords, else your entry is not valid. Ensure your name/ stage name, email address and wordings of the video are in the information box of the video. If the information box cannot contain the wordings of the poem, send it to wordup4one1@gmail.com stating your name and title of the poem with the hashtag in the subject box of the mail. Ensure your video submission is not be more than 3 minutes long and remember it must be uploaded on your Youtube channel. If you don’t have a Youtube channel, please open one. The submitted video must be one camera, one poet and recorded specifically for the competition. No live performance videos and no special effects. Please note that all poets are limited to one submission ONLY. You will be required to post the link of the Youtube Video in the comment section of any posts on http://wordup411.blogspot.com, to render your entry as valid. Video submission starts NOW till Midnight of June 14, 2013 !!!!!! 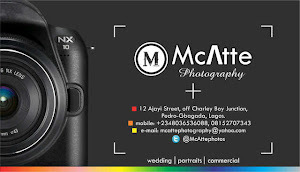 The Actual date, venue and time of the competition will be communicated once we have our finalists. A total of 15 poets will be chosen from the entries for the competition. The first ten will be chosen by our in-house judges. The last five will be chosen based on most viewed, most liked and the videos with the most comments. then you should not miss this one chance, to kiss words and make them dance. Thank you for your entry. But you need to change the youtube's video name to #WarOfWords-life for your entry to be valid.